"Damn it girl!! What the Heck are you doing?!" "Damn it girl!! What the Heck are you doing?!" Last I checked, this character's cosplay outfit was available at Milanoo, Moon Costumes, and Xfancy. The above info came from Cyber-Punk, and was edited by yours truly (contact me). The image came from Memento: Autumn Anime. Ichigo Kurosaki is a Teenager with a bit of a bad attitude and a very short temper. Regardless, he fights others to protect ghosts. (Yes, He can see them.) He keeps to himself a lot and does not like opening up to others. Deep down, he does care about the people around him, even his Dad, who likes to roughhouse with Ichigo. He is sometimes called "Strawberry" because phonetically his name is the Japanese word for strawberry (イチゴ). The kanji for his name means one (ichi) and protect (go). In episode 21 when Ichigo was fighting Jindanbou, guardsman of Gate of the White Way in Soul Society, Ichigo claims that his name translates to "number one guardian" (ichi - first/best, go - "guardian angel"). Ichigo's zanpakuto is named Zangetsu ("Moon Cutter"), though he doesn't realize this until he begins training under Urahara. Its unawakened form is very large and bulky, yet it isn't as powerful as compared to other sealed zanpakuto due to Ichigo's inability to control his own spiritual power (this form of the sword is shown above). This doesn't become apparent, however, until his encounter with Byakuya Kuchiki, who cuts off most of the blade. Subsequently, training with Urahara allowed Ichigo to finally get in touch with the spirit of his zanpakuto and reawaken his Soul Reaper powers. Further training forces Ichigo to finally learn--and call out--its name, thus awakening it. 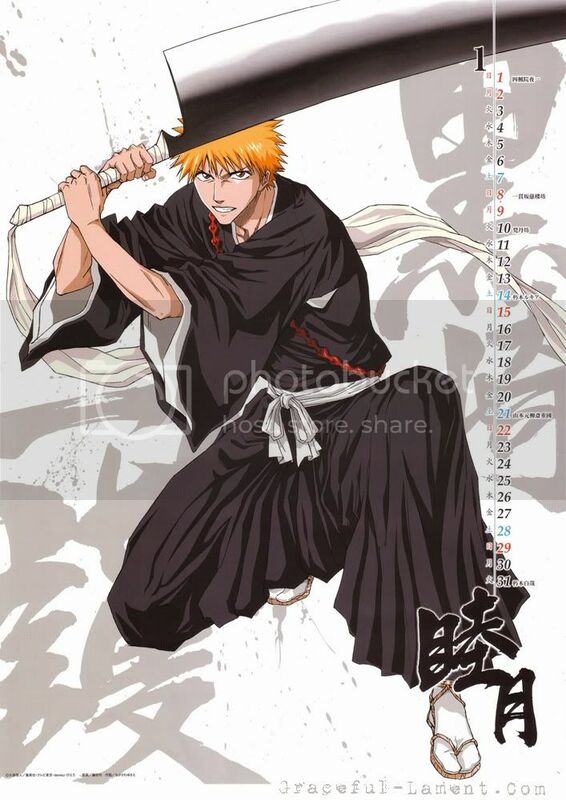 From then on, Zangetsu always assumes at least a released [shikai] state because of Ichigo's overabundance of spirit energy (this is the form seen in the nearby picture). Its special attack is called getsuga tensho ("Sky-piercing Moon Fang"). 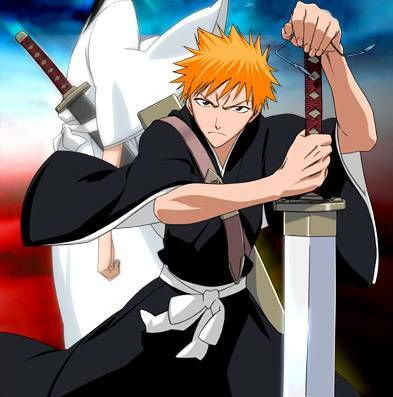 Again, Ichigo does not realize its name until he talks with the spirit of Zangetsu, who notes that knowledge of the technique affects its power. Thanks to help from a device of Urahara's, Ichigo is also one of the few Soul Reapers not of captain rank to have achieved his zanpakuto's final release [bankai]--Tensa Zangetsu. What's strange is that most bankai reach out and change into huge forms--his compresses all the power *inward* (the sword itself compresses down into the size of a traditional nodachi or Japanese longsword). So instead of unleashing new attacks, Tensa Zangetsu enhances what's already there, from his natural physical ability (giving him speed that can surpass the flash step) to his getsuga tensho attack (which gains both power and control) to even his garb (which changes into a black coat similar to that worn by the spirit of Zangetsu). Because Urahara's training took Ichigo to the edge of becoming a Hollow, that Hollow personality remains in him and will emerge at key moments during the Soul Society arc in order to protect Ichigo's life. It also risks emerging if his spirit energy destabilizes--which tends to happen when Ichigo is utilizing the demanding final release. Knowing how dangerous this evil side of him can become, controlling it becomes a constant concern. It is only during the Arrancar arc that he gains better knowledge about his Hollow side and learns how to better control and exploit it. He also realizes then that he is not the only vizard (a Soul Reaper also able to utilize Hollow powers) around. Fun fact: On his bedroom is the number "15" which is if read as separate numbers the numbers "one" and "five" in Japanese: ichi(一) means one and go(五) means five. On top of that he is also fifteen years old. The above description came from Cyber-Punk and Who Wants to Know?, and was edited by yours truly (contact me). The image came from photobucket. Ichigo Kurosaki is a high schooler who lives with his dad and two sisters at their clinic. His mom died when he was younger (he was 9 and his sisters were 4), he blames himself for that because she was trying to save him. Ichigo could always see ghosts and spirits when he was younger, and his skills have grown so now he can touch and talk to them. One night a death god, by the name of Rukia, came to his house. She was shocked that he could see her. She had come because a hollow, a fallen soul, was attacking Ichigo's house. The hollow demolished part of the house and had harmed Ichigo's sisters, Yuzu and Karin. When the hollow was about to kill Ichigo, Rukia got in the way and got severely injured. Ichigo stabbed himself with Rukia's sword, so that he could defeat the hollow, which he did. By stabbing himself with her sword he was supposed to absorb some of her power. He was supposed to get half her power, but he kept going. Thankfully, Rukia broke the connection before he could take all of the power. But Ichigo's sword is stronger and more powerful than Rukia's. Also, his powers are far more developed then hers, for he can see and use spirit threads, which only powerful death gods are supposed to be able to use. Ichigo gets missions at sometimes the most inopportune time, sometimes in school even. Since he can't be a death god and be seen at the same time, Rukia has to force his death god self out of his body, leaving his body unconscious until he finishes what he sets out to do.